In answer to the third question, these are wonderful problems to have, because you do possess the ability to make stuff (I’ve found most readers of Epoxyworks have that ability). You have the power to create the non-existent part, fabricate the unavailable gizmo, fashion the unobtainium. Because you can produce “you name it,” that door of opportunity is open for you. I offer the following projects I’ve taken on that might set you thinking about how you can make something you desperately need and can’t buy. 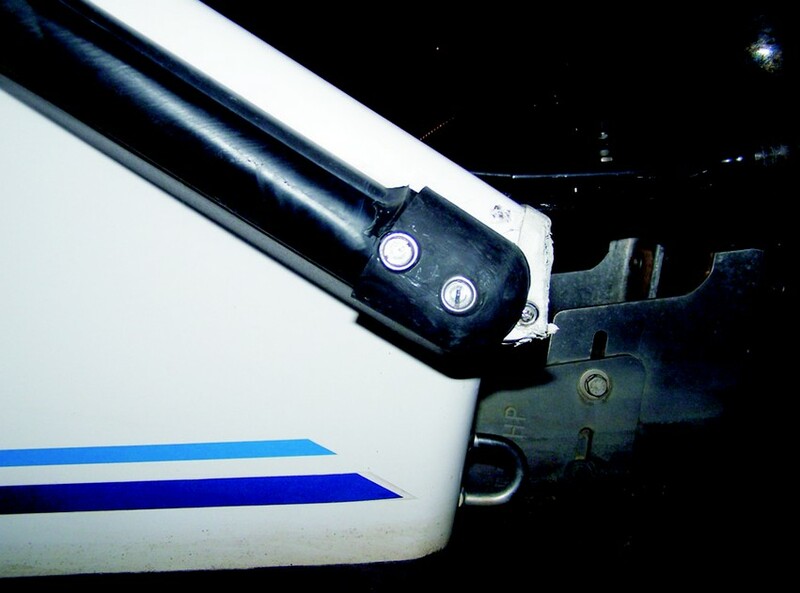 My boat’s swim ladder attaches to a bracket which allows you to remove the ladder and stow it when underway. The bracket is a stainless steel fabrication and on my boat it is attached to the hull’s side rather than the transom. I never would have thought a little swim ladder bracket could make so much spray. My wife sat where she thought was safe from sea spray, and got soaked. I tried to make a shield by cutting a PVC tube, but that would have been too easy and the fit didn’t even come close. This was one half of an asymmetrical cone that had to be strong enough to take wave impacts on the order of 200 lb and divert the water. I needed to fashion some kind of fairing. Using stiff, brown paper I kept cutting it with scissors and bending it over the bracket as a fairing might until I produced something that looked right. My axiom has always been, “Trust the ol’ eyeball.” This paper cutout became my pattern after I thought about it and looked at it for a day. I then cut one layer of 738 Biaxial Fabric with mat fiberglass from that pattern and placed it on 4 mil plastic and wet it out with mixed WEST SYSTEM® 105 Epoxy Resin®/206 Slow Hardener®. I covered it with another piece of plastic and left it to lay flat for an hour or so, allowing it to stiffen somewhat as the epoxy began to cure. 738 Biaxial fabric with mat ready to be wet out with epoxy, placed between sheets of plastic and molded to shape when the epoxy gels. 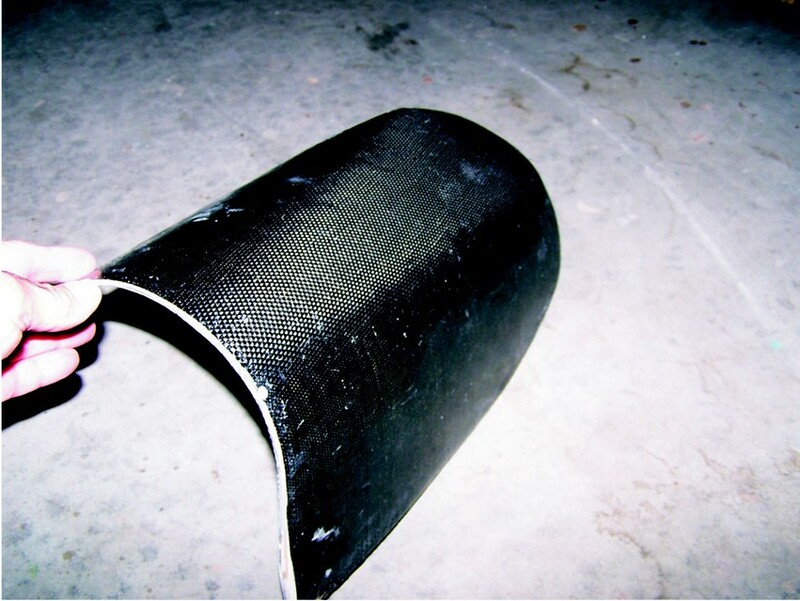 The part with woven carbon fiber bonded to each side. About an hour and a half later the laminate had stiffened. It was still flexible but when I formed it, it held its shape. At this point, I could form it to the shape I’d described with paper: half of an asymmetrical cone that the fairing needed to be. It stayed put and cured. The next day I peeled off the plastic, faired the part smooth and bonded a layer of 5.8 oz woven carbon fiber to each side. With that addition, it became one tough taco, mighty enough to handle wave impacts. The edges needed a little trimming, and I scribed it to the hull’s shape. By the way, the best bet for marking carbon fiber is a Sharpie metallic silver marker. Before bonding it to the hull, I stood on it to test the part’s strength. Now, spray is nicely deflected, my boat runs clean and my wife stays dry. Time to conceive and build: 7 hours. Limitations of this technique: Parts must have quite a bit of shape to them, be free of close tolerances and not too large. If too flat or too large, the flexible, partially-cured laminate will not support itself as it cures. Rub rails are made for rubbing against a dock. The end cap for the rub rail was swept off my boat when it hit a dock. I went to the chandlery for a replacement. “No identification marks to tell who makes it,” the clerk said. “How about the catalogs?” Zero. “Contact the builder?”” No such luck. I did have the cap from the other side of the boat, so I removed it and set about to use it to make a mold to cast my own. I troweled a thick layer of WEST SYSTEM 105 Resin/206 Slow Hardener thickened with 404 High-Density filler into a cavity in a foam packing lid (any disposable box or cup would have worked). When pouring mixed epoxy in mass, use Slow Hardener to help prevent excessive exotherm. 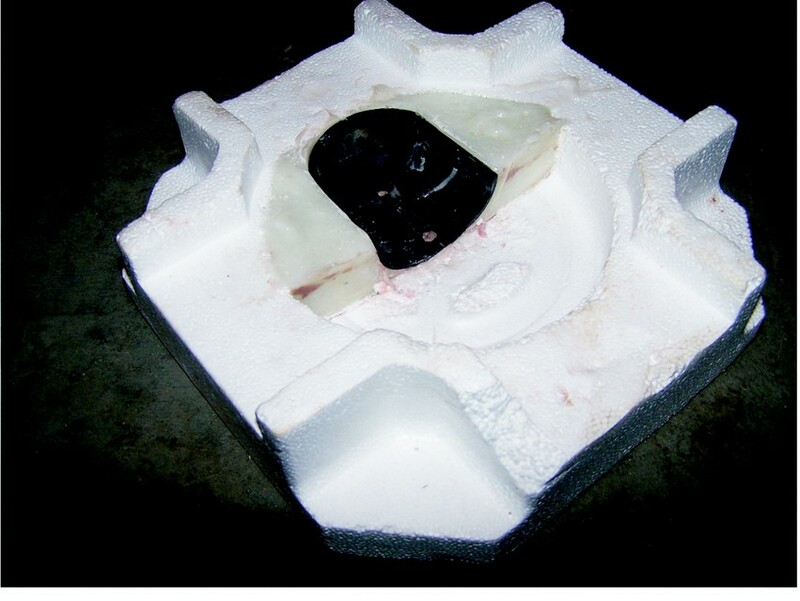 The existing cap was used to make a female mold in the thickened epoxy. The cap left a good impression of itself in the cured epoxy. I coated the cap with a thin layer of axle grease and pushed it into the mixture to make a female mold of the outside shape of the cap. The next day I popped the part loose. The fastener holes in my old part created bumps in the mold and dimples in the new part which I’d use as a guide for drilling fastener holes. I cleaned the mold. There were a few flaws in the surface which I filled with toilet bowl sealing wax. Since axle grease worked so well for casting the mold and since smoothness of finish wasn’t a priority, I’d use it in the mold to make the part as well. 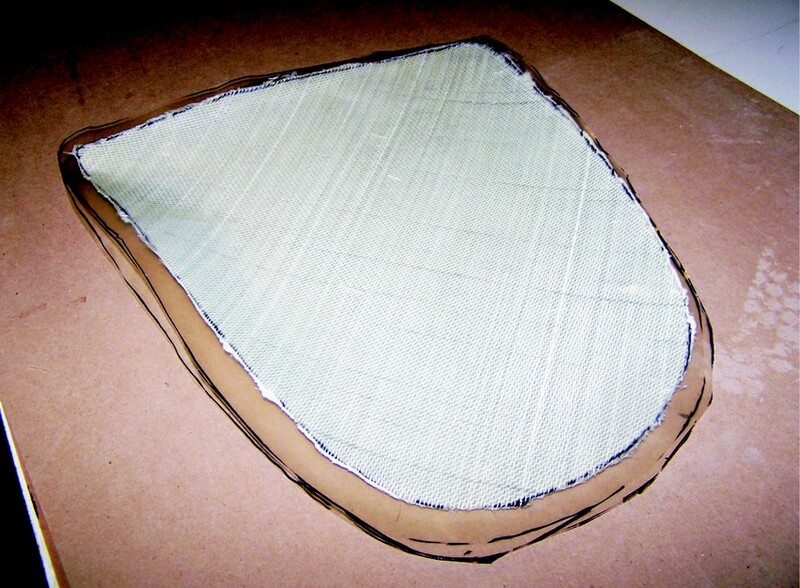 I cut fiberglass to shape from a paper pattern I made from the mold cavity. To match the thickness I used my two coin technique— layers of glass between two coins (quarters) lightly pressed between my forefinger and thumb. Measuring the gap between the coins I added more layers until I matched the thickness of the part I was duplicating. 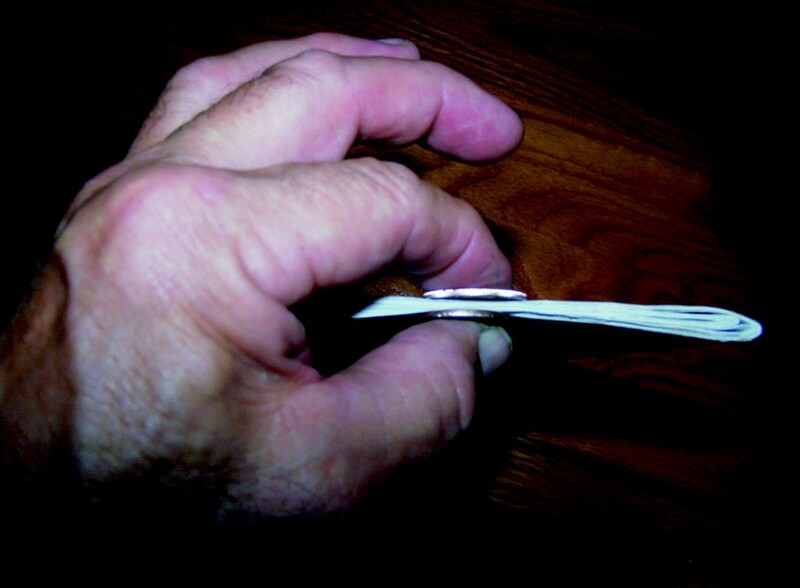 In this instance, a 1/8″ thickness took six layers of 6 oz fabric. Thickness dictates laminate stiffness. Matching laminate thickness will generally result in similar stiffness to the part you are replicating. The finished rail cap installed. I wet these out with epoxy and placed the whole stack into the mold. In this spherical shape, placing the fabric on the bias helps it conform better. I tinted the 105/206 epoxy black with 423 Graphite Powder so my part looked like the original. While I was at it I made an extra cap. If I had an extra, I figured I’d never hit another dock. Time to make the mold and produce two parts: 4 hours. Limitations: Not too many but you’re building a mold so this method is best for making multiple parts. For this particular part, I’m not sure there would have been another way to make it. A davit is a small crane fitted on a boat to hoist and lower a dinghy. Usually davits are mounted in pairs on the aft end of a larger craft. A tackle or winch is usually required to raise the load. Commercial davits are generally made of stainless steel or aluminum. Most I’ve seen are heavy, expensive and in my opinion ugly. 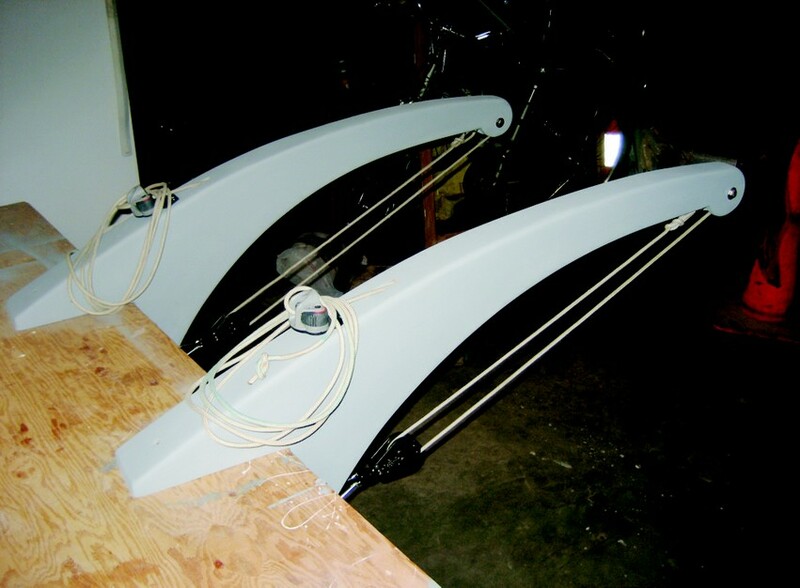 For my new power catamaran I wanted davits that were lightweight, graceful looking and low cost. That meant I’d have to make them myself. My stitch and glue 7′ 10″ Sabotina dinghy I built from Glen-L plans (which I was very happy with) weighs 70 lb. Two davits share the weight, but must be able to handle all the weight in case of a weight transfer situation. In addition, the davits must withstand wave shock loads which might be three times the applied load. I figured the davits should handle 200 lb with plenty of safety margin. To prevent the dinghy from filling with water, I fitted it with a bailer to help keep the weight down. The davits needed to be about 10% longer than half the width of the dinghy’s beam. There had to be a plan for attachment to the boat. These were to be manually operated davits. Using this criteria, I designed and built my davits. I sketched out my scaled design on graph paper, then transferred it to a flat plywood surface with a larger grid. This made scaling it up to the actual size easier. I built the davits on this surface. I faired it with battens and darkened the lines of the final shape. Blocks (for clamping) were screwed down to my plywood base along the line describing the davit’s shape. 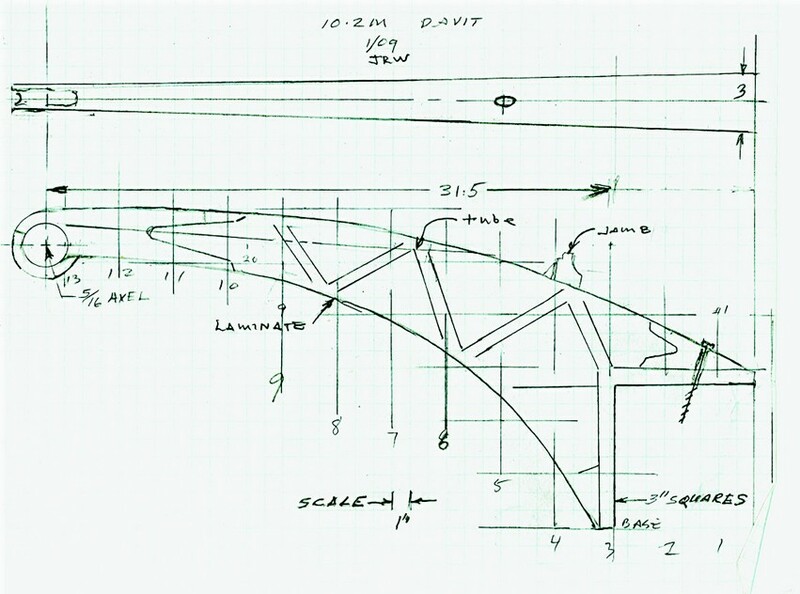 The design was first sketched out on graph paper. Clamping block served as a “stuffing jig” compression struts connected top and bottom laminate to create a truss. Nearly completed davits with primer applied. Note hoist line exit from top of the davit. The top and bottom of the davits are 4 layers of 1/8″-thick spruce sandwiching 3 layers of 3″ wide unidirectional carbon fiber tow resulting in a little over 1/2″ thickness. I figured the two laminations, one-inch total thickness, would support 200 lb. The wet-out laminations were clamped together against the blocks. After they cured, I trimmed the pieces, tapering them from the root to the tip (in the top view). This would give the arms a graceful look and reduce weight on the ends. Putting diagonal bracing between the tops and bottoms increased strength and stiffness further without adding much weight. I put the trimmed pieces back against the clamping blocks and used it as a stuffing jig. I cut and fit 1/2″ × 1/2″ braces to serve as compression struts creating a truss that also keeps the side walls in column. 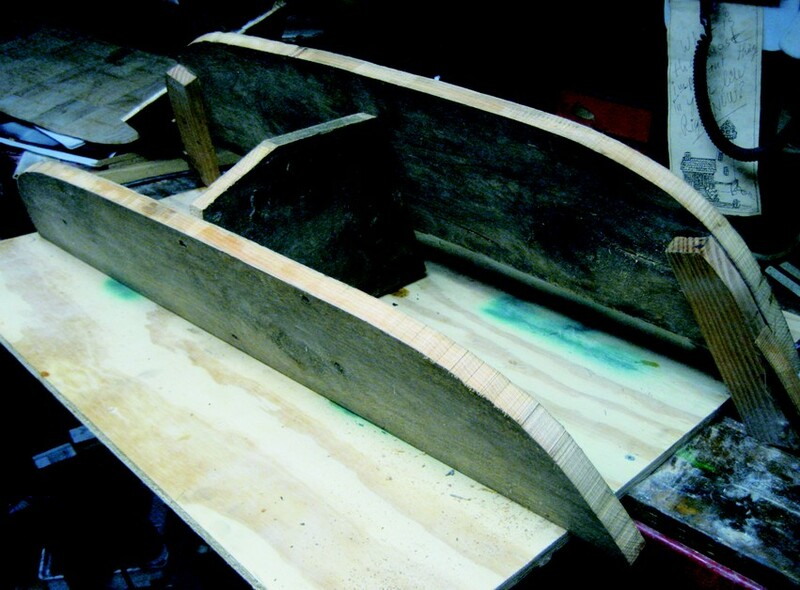 I used solid stock to beef up the root ends where they would be mounted to the hull. I fit a 3/4″ PVC tube under the top of each davit between the braces for the hoist line to pass through. I roughed up the PVC with 60-grit sandpaper and bonded the end where the tube passed through the top face. The tip was reinforced with a double thickness of plywood to reinforce the end for a sheave axle. I planed and sanded the two sides flush and bonded 4mm thick plywood to each side to complete the structure. I placed weights on the plywood for clamp pressure. (Lead weights cast in a cupcake pan are handy to have around.) I rounded the corners and coated all surfaces with three coats of epoxy. No fiberglass was used. The davits are attached at the boat’s seat back which is a foam/fiberglass structure with reinforcement in the davit area. I made the davit base 3″ wide so it would have lots of lateral stability. With the notched configuration, I’d have lots of gluing area. The davits are glued to that structure with a long stainless steel lag screw bonded in place with epoxy after passing through the root end blocking. A typical person can pull 40 lb. So all I needed was an eye that served as a dead end to yield a 2:1 purchase to ease the work. Cam cleats were fitted to the davits near the exit tube to secure the hoist line. Each davit weighed 5 lb. To test the finished davits, I hung from each, one davit at a time. Time to conceive, design, build and install: 30 hours. Limitations: The lighter the dinghy the easier it is to make the davits strong enough. How the davits are attached to the mothership is crucial. In this example, the attachment arrangement was ideal. I wanted a small sink that would conserve water, install flush with my custom countertop, and have a certain stylish look. I call my design the Euro Sink, and fashioned this item myself. 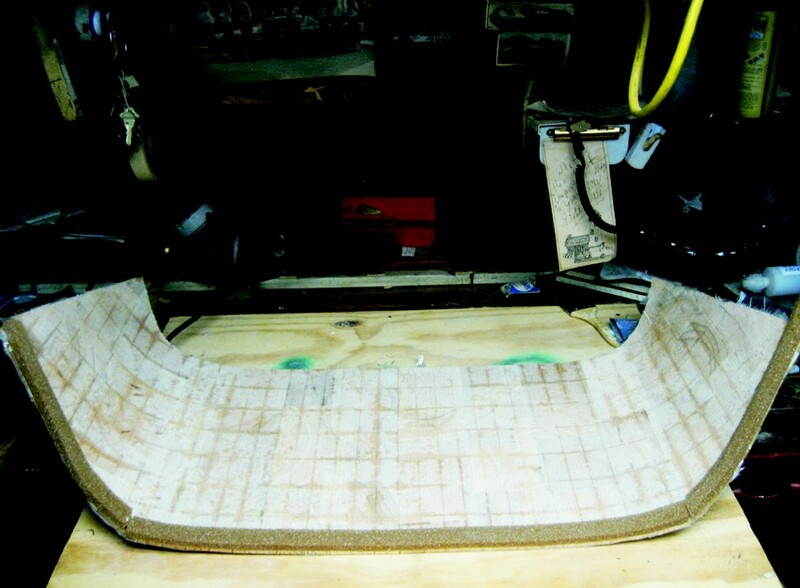 Plywood only bends in one plane. But if two bent panels join at an angle, you can get some interesting shapes, something like what I wanted. I cut symmetrical, temporary forms from wood and joined them together. I then bent 3mm-thick plywood around the form and bonded the two panels together with a fillet. I placed glass tape over the outside, resulting in sufficient strength to remove the forms. Then I could hold my creation in my hands, turning to view from all angles and assess its appearance. 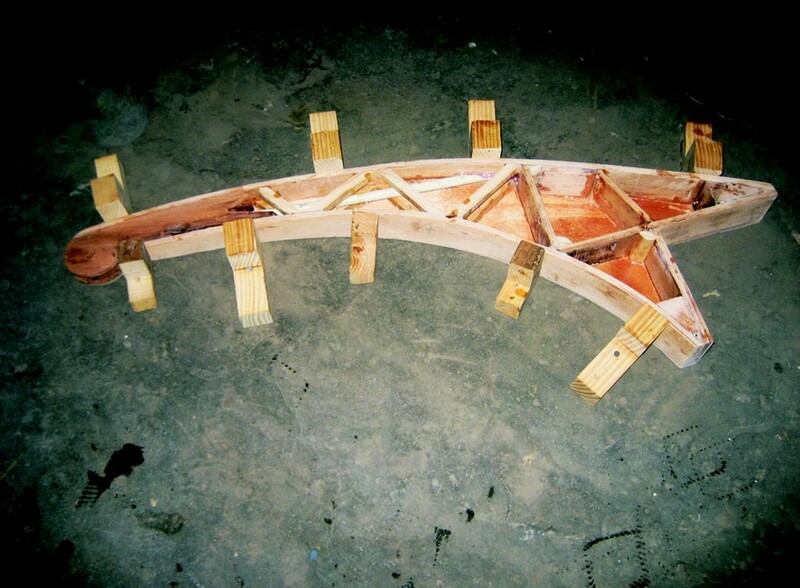 Two plywood panels are joined over a temporary form to produce the desired shape. The sink was bonded into the counter cut-out. 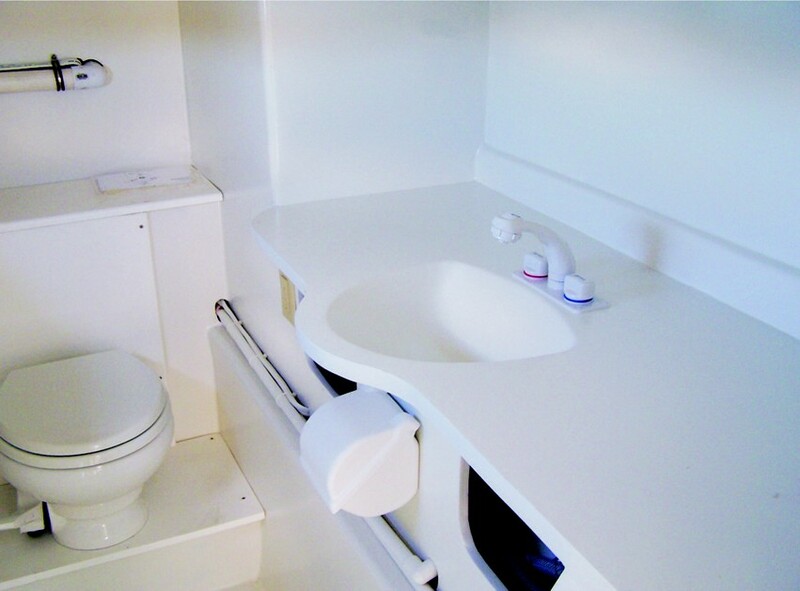 The finished sink in the finished counter in the finished boat. Satisfied with what I had (actually I built two and chose the one I liked best) I put a big fillet on the inside corner like a sink should have, then applied a 5.8 oz woven carbon fiber to the inner surface yielding a metal-like, water tight structure. The sink was then bonded into the counter cutout. I used a Delran™ thru-hull fitting for a drain. The whole unit was painted with Awlgrip™. I’m pleased with the way it looks and the size is just right for the boat’s head. It holds water. Time to conceive, design, build and install: 12 hours. 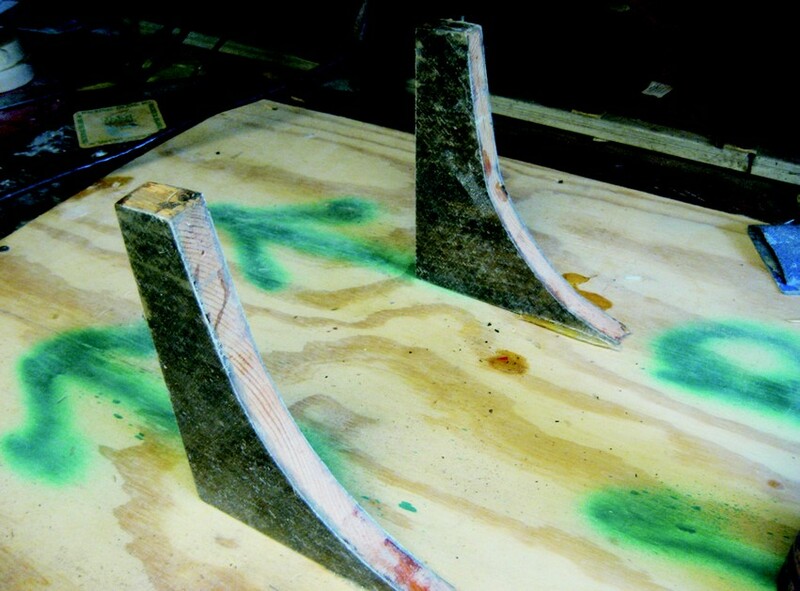 Limitations: As plywood only bends in one plane, shapes are limited. Flat panels might result in a boxy look. Besides, you can buy stainless steel sinks pretty reasonably but not one shaped like this. 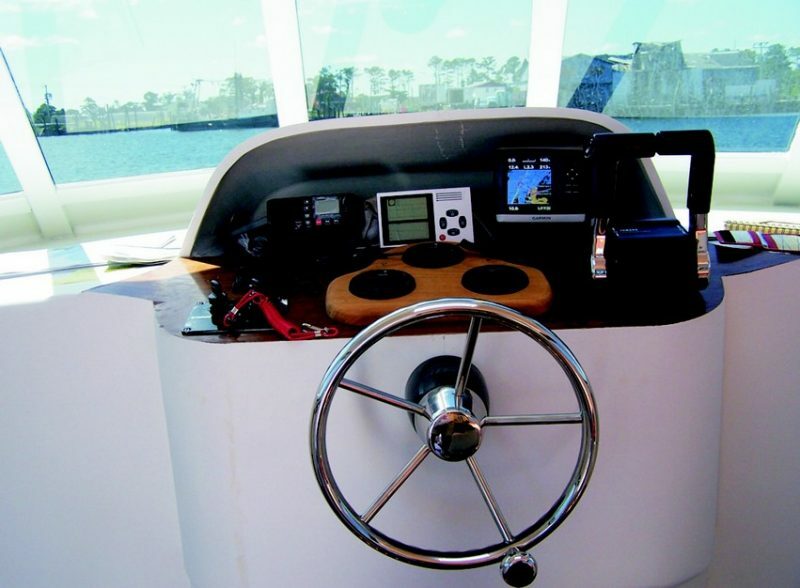 The instrument hood on my boat houses the GPS chart plotter, VHF radio, a digital barometer and a 12-volt outlet. The existing instrument panels were the wrong size or the wrong shape—nothing existed like what the designer had drawn. It had to be built. I wanted to build it without a mold, yet keep it lightweight. Why didn’t I want to make a mold? Molds are often a great time and material commitment— especially true for one-off parts such as my instrument hood. 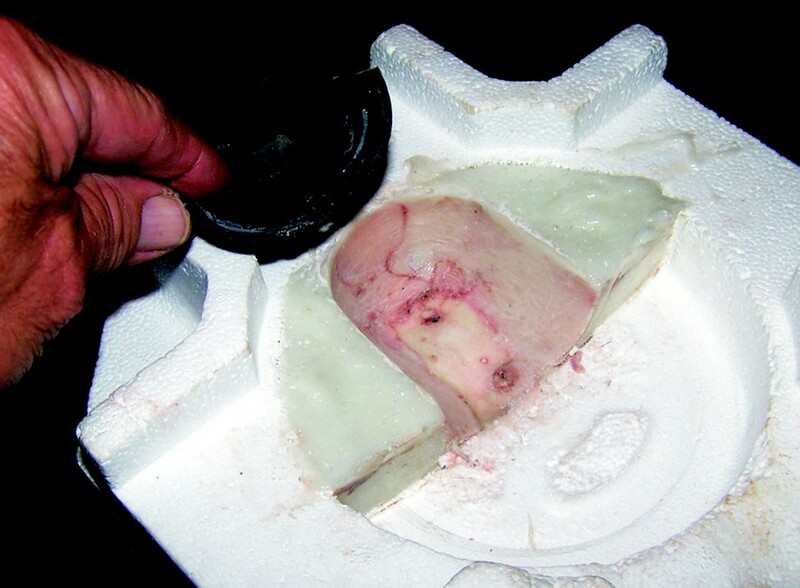 A mold would have been as much work to produce as the part. So I set out to build this hood by combining the methods I’d used to build the sink and the swim ladder fairing. The shape of the hood limited what materials it could be built with. 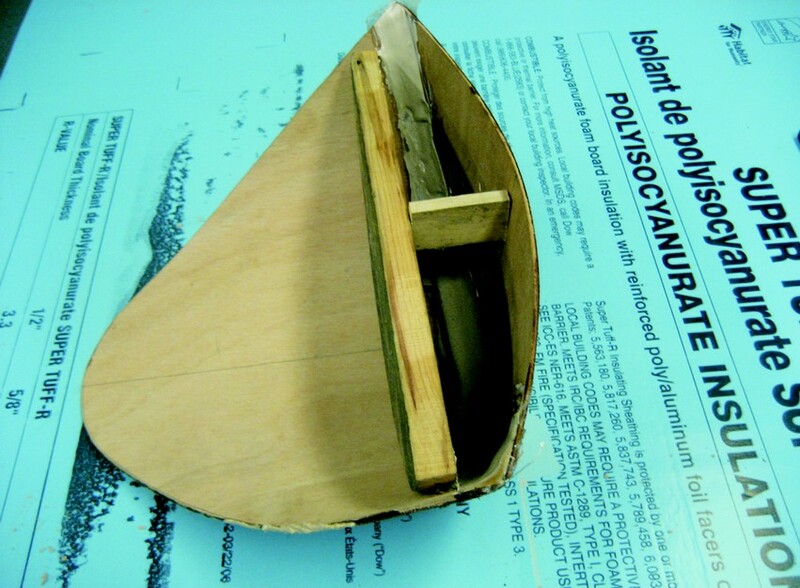 Plywood wouldn’t make the sharp bend needed for the corners, but a grid-scored core such as balsa or foam would. But a grid-scored core doesn’t support itself without a mold. So the strategy was to create minimal support, something like a mold, until the skins were applied. Curved parts are inherently more rigid because a curved surface collects loads and turns them into lateral ones. The hood would never see much force; it really only had to hold itself up with some margin of safety in case someone leaned on it. 3/4″ foam core with 6 oz fiberglass on each side made a surprisingly rigid panel at a mere 1/2 lb per square foot. I felt good about the part’s strength and the projected weight. To maintain a flat top I would use my flat shop bench surface. To control the 150mm diameter curved ends, I fashioned four wooden gussets and joined these to my bench top with fast-curing G/5 Five-Minute Adhesive. I placed 4 mil plastic between the bench and formers to prevent inadvertent adhesion to the work bench. This was an issue because I had to apply the fiberglass reinforcing on the top surface (underside of the finished hood) and was sure the epoxy would pass through the 3/4″-thick, grid-scored foam. The gusset-like forms guided the tight radius. they’re connected to my workbench which supports the flat section of the hood. The bench top provides a flat surface while the gussets establish the curvature. I wet out the 6 oz fiberglass using WEST SYSTEM 105 Resin/206 Slow Hardener. My little shop was pretty warm that day so I kept the door open to make it a little more comfortable. But after the lay up was complete I closed the door and let it get real warm inside, a little over 90°F. Two hours later my laminate was cured to the point where I could trim the excess fiberglass along the edges with a utility knife. I then flipped the part over and placed it on a wooden male form that I’d screwed to my work surface. The shape I had struggled to envision and was not sure how to produce just a short time ago now lay before me. The tighter the curve, the more the grid score opens on the outside of the curve. The gap is even greater the larger the blocks of the grid score. I filled the gaps that opened up on the outside of the curves with epoxy thickened with 410 Microlight™. When that had cured I sanded the surface smooth and applied 6 oz fiberglass to the exterior surface. The back surface of the instrument hood is flat, so I made it out of 3mm plywood. 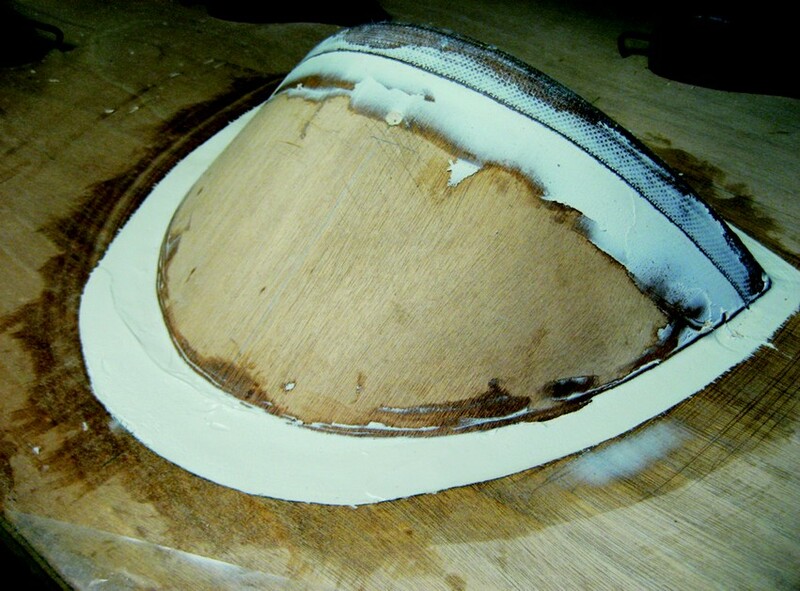 The plywood back is joined with a fillet and fiberglass tape. I coated everything with epoxy tinted with 503 Gray Pigment. I like to get the object all one color to give it unity. It also highlights flaws that can be adjusted, in this case with fairing. Now the parts were ready for final sanding, painting and installation. The foam with reinforcement on only one side was then placed over this male form and glass was added to the outside surface. Instrument panel mounted, but without bezel in place. The bezel portion of the instrument panel is cane rattan. I traced from a paper pattern and cut the rattan to shape with scissors. Then I bonded plywood to the back side perimeter and painted it flat black. The openness of the rattan would allow the instrument panel to stay cool, and I think looks pretty good. The bezel is attached to the instrument panel with Velcro™ tape. Time to build and finish: 12 hours. Limitations: size, although I did a cabin roof that was 8′ × 7′. I don’t know if you could produce a shape with curves in the second plane with this technique. I began working at Gougeon Brothers, Inc. over four decades ago as a boat builder. Thirty years ago I became a Technical Advisor, which presented the opportunity to talk to so many creative folks building and fixing things with epoxy. 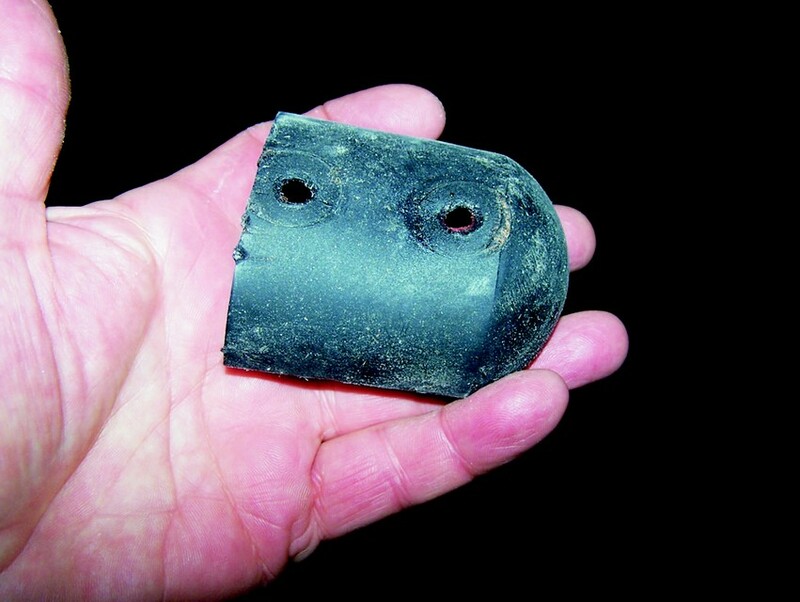 This article represents one of hundreds written for our publication Epoxyworks. This will be my last one as I am retiring. I plan to cruise on my new boat ION—now in North Carolina, with her davits, instrument hood, Euro Sink and swim ladder fairing— around the Chesapeake, ICW and Bahamas. ION is a fuel-efficient, 10.2 meter power catamaran designed by Roger Hill of New Zealand. The boat was built for me by my long-time friend Craig Blackwell of Blackwell Boatworks in Wanchese, North Carolina.